No. 35 is a 165DE class Ruston & Hornsby 0-4-0DE with a 155hp Ruston engine and a weight of 28 tons. She was ex-works from Ruston′s works in Lincoln on 10/1/1958 to the Tyne Improvement Commission, later Port of Tyne Authority, Albert Edward Dock, North Shields, Northumberland, with works number 418600. In 3/1984 she moved across the River Tyne to the Port of Tyne Authority′s Tyne Dock and in 1/1992 to Marley Hill. Here she was repainted from the Port of Tyne Authority′s blue livery to her original Tyne Improvement Commission green livery and acted as shed pilot until being stored in the five road shed awaiting overhaul. 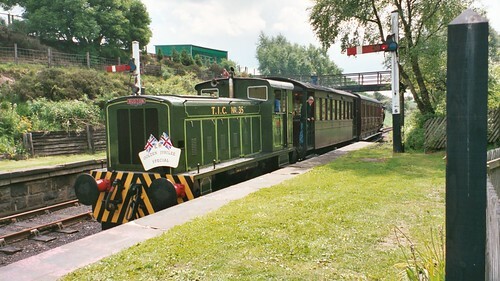 In September 2012, overhaul of No.35 commenced, and is expected to be completed before 2013, when No.35 will re-enter service on the Tanfield Railway.